Find below the latest Chalfont Softball Club news. The page is ordered with the most recent at the top. 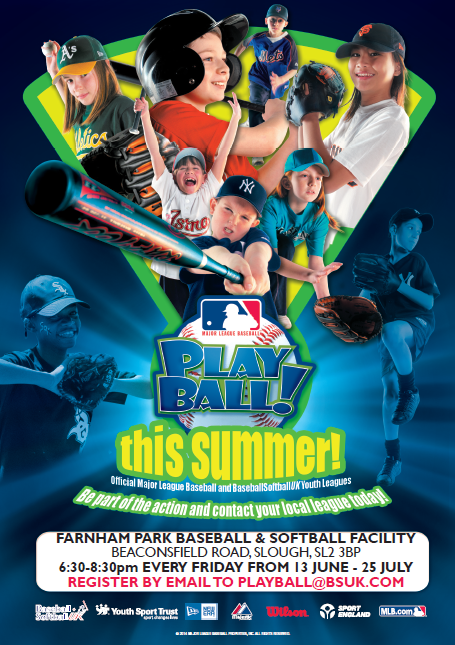 PlayBall, a baseball programme for children aged under 14 is now underway on Friday evenings at Farnham Park Baseball and Softball Facility (SL2 3BP) in Farnham Common. The programme has been initiated by BaseballSoftballUK and lead by GB Baseball Coach Sam Dempster is being heavily supported by Chalfont Softball Club, who are planned to take over the overall running of the programme in 2015. Running every Friday from 6.30pm until 8.30pm until the end of July, the sessions for children aged from around 8 upto around 14. They are designed to introduce the basic skills and game concepts of baseball and then develop them so that the children can fully experience the game of baseball. We are currently trialling the clubhouse of the South Buckinghamshire Golf Club that is literally just a three minute drive from Farnham Park. The cllubhouse has recently being built and offers a fantastic bar area with a great choice of alcoholic and soft drinks. If we decide to continue to use it post-match, their patio overlooking the golf course should be an excellent location for our drinks. We used it for the first time last Tuesday after the Phoenix -v- Flames game and will be using it again on Tuesday after Phoenix host Richings Park and Flames host Maidenhead. They can provide a full choice as above where each person individually chooses, however if we can agree (maybe by the week) on one option only for the evening (could be any of the above or something else such as lasagne, chilli or curry) then that could be made available at a lower price (based on it being easier to mass cater rather than for individual orders). At the last committee meeting, we identified a need for the club to hold more social events away from the softball pitch. We had a successful bowling evening in the closed season and we will be holding a club social on the evening of the EGM on Friday May 23rd, but we're looking for a member to take on the roll as Social Secretary (aka party organiser) to come up with ideas and then set up many more dates throughout the summer and into the winter to get us together and become closer club. Do you have some great ideas for how we can elevate the social side of Chalfont? Maybe rather than one person, you'd like to take it on as a pair with a friend. If you do and would like to get involved then please let us know. The first point of contact should be with our Volunteer Co-ordinator, Helen Turner (volunteers@chalfontsoftballclub.co.uk) who will be able to answer any questions you may have with regard to the role.